Wow-wee - Auckland is the place to be! Especially on Friday. As the afternoon ticked along the crowds were building in the city. I left work around 3:30pm and there were people everywhere. The atmosphere and buzz of the opening ceremony, fireworks display and first rugby match at Eden Park had everyone talking about the same thing. It was pretty exciting, even though I'm not really a follower of New Zealand's adopted national sport. Jef went to work at 7am for a major project he was implementing on Friday, so he was able to pick Kien up early from daycare. We headed into town soon after I got home. We crossed Victoria Park, and the moon was so prominent in the afternoon sky. Kien found himself a stick (yet another one - you don't want to know how many sticks we just cleared out of the apartment!). We got to the Viaduct in time to catch the Waka maneuvered on the glassy water, the chanting load and echoing around the marina. Party central looked awesome, and with Neil and Tim Finn being transmitted throughout the downtown area the buzz was magical, and exceptionally friendly. We were lucky enough to be in line to get Kien something to snack on, and a couple who had just collected their food gave Kien a carton of fries because they got too much. How nice was that! We stopped into The Hilton on Princes Wharf for a drink while we waited for the fireworks. Of course you can imagine how crowded the place was. 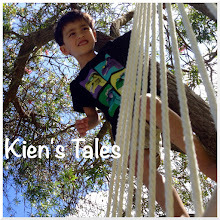 Kien was in such good spirits, giggling and jumping around. He had his milk on the floor of the Hilton, and we had ours. Trying to dunk his biscuit into Jef's "milk". Soon after the Auckland central sky was on fire. We could not hear the music above all the screaming and whistling throughout the amazing fireworks and light show. I didn't know where to look to catch it all, as there were fireworks shooting from the Sky Tower and from four different spots in the harbour. It really was a spectacle of monumental proportions. When it was all over we made our way home, and in amongst the hustle and bustle of lights and people Kien crashed out in the security of his daddy's arms. The city skyline looked so vibrant and alive with excitement as we traced our steps back through the park. It was a perfect Spring evening; crisp but not too cold, still and peaceful under the bright moon and street lamps that guided us home.